Herringbone Hoedown is the sixth design in my Parade of Pattern series. These simple projects explore common stitches in an uncommon way. 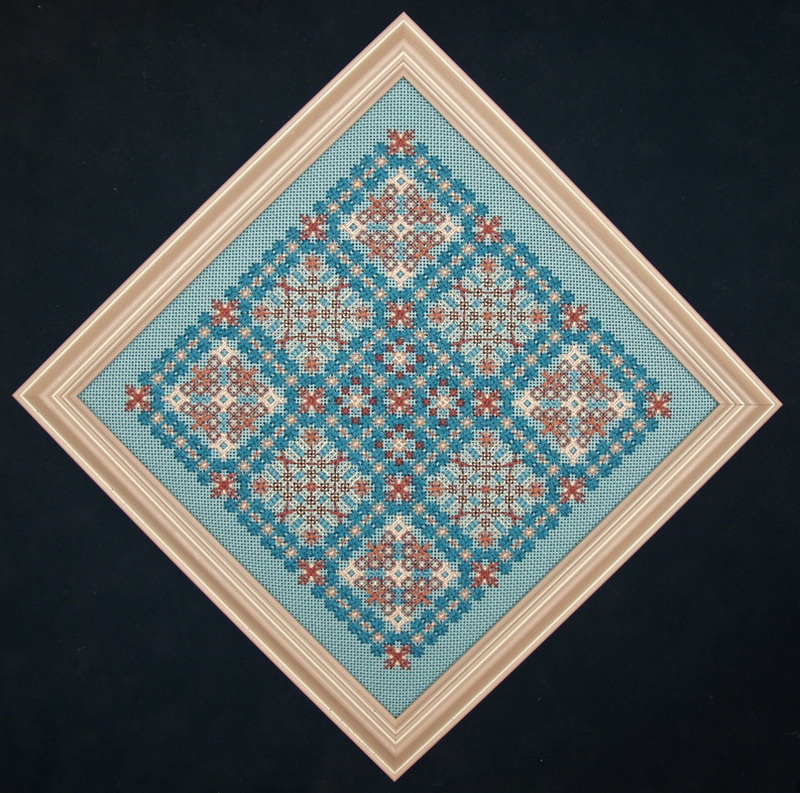 In this design the Herringbone stitch is used in a four-way sequence that produces an interesting cluster which forms the outline for a nine-patch geometric design. Several variations of this unique stitch are used in the area fillings along with some couching and blackwork accents. A complementary color choice was chosen for the original model. Peach and rust shades combine with aqua and teal tones on the 18-mesh Aquamarina ground. However, almost any two colors can be combined as long as similar value contrasts are maintained in the threads chosen. La Lame' metallic braid (now available as Rainbow Gallery's Coronet Braid but not in the copper and russet shades listed). Kreinik # 8 and #16 braids in #021C copper cord can be substituted for the copper listed below, and #052HL bronze lustre would be the closest available russet shade.